If you’re desperately searching for some inspiration for where to take the family on holiday this year, it can be tough to find something that really gets you excited or that you know 100% that you’ll all love. After all, it can be hard to keep a whole family happy! A place you may not have considered is Barcelona, and it may be a really great option for you all. I went years ago and loved it. Here are some tips for a great family holiday in Barcelona! Having a family cramped into a hotel can sometimes be a bit of a nightmare, and luckily, you can rent a whole apartment for your stay in Barcelona just as cheaply, in most cases, as a hotel! Check sites like ClassBedroom for some more info on apartments in the different districts of Barcelona to see what you can get for your money, and to see which of the many fabulous districts takes your fancy for your stay. For us, being a larger family, we find apartments to be a great way to be more comfortable and also a great way to save money. When you don't have to eat out all the time you quickly see the savings. Apartments are typically similarly priced as hotels and their per person policies but even when they are a bit more expensive we've found that it pays off quickly in the end on family sanity and kitchen use alone. Public transport in Barcelona is not only really reliable but really family friendly. Almost all metro stations and buses are accessible with pushchairs so you won’t have to worry about the struggle of getting on and off too much. There are metro and bus stations near most of the major attractions too so you can relax knowing you won’t have to walk far when you get off. You probably won’t even need a car in Barcelona, which is a huge plus and will save you lots of cash. 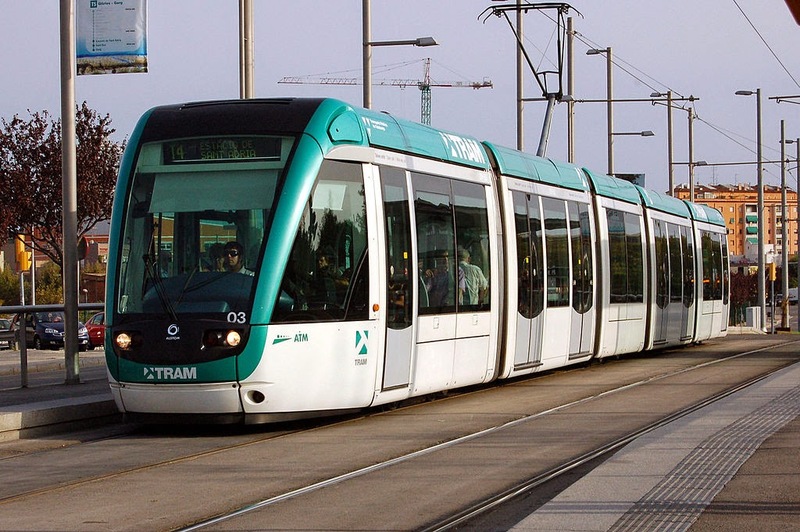 "Tramway de barcelone 1" by Fabien1309 - Own work. Licensed under CC BY-SA 2.0 fr via Wikimedia Commons. When I took my trip through Western Europe, I used public transport alone and had no issues with it at all, in fact I think it is far less stressful than trying to figure out where you are going and navigating city driving in a new place. As a tip though when booking a spot to stay it is much nicer to be close to a metro station! As it’s such a popular city with tourists, there are plenty of things for the whole family to do so you won’t have to worry about struggling to find fun and entertainment to suit the whole tribe. The L’Aquarium is one of our favourites (and is sure to be a favourite with the little ones too!) and you can get discounted tickets online, too. There is also an interactive science museum which is well worth a visit as well. 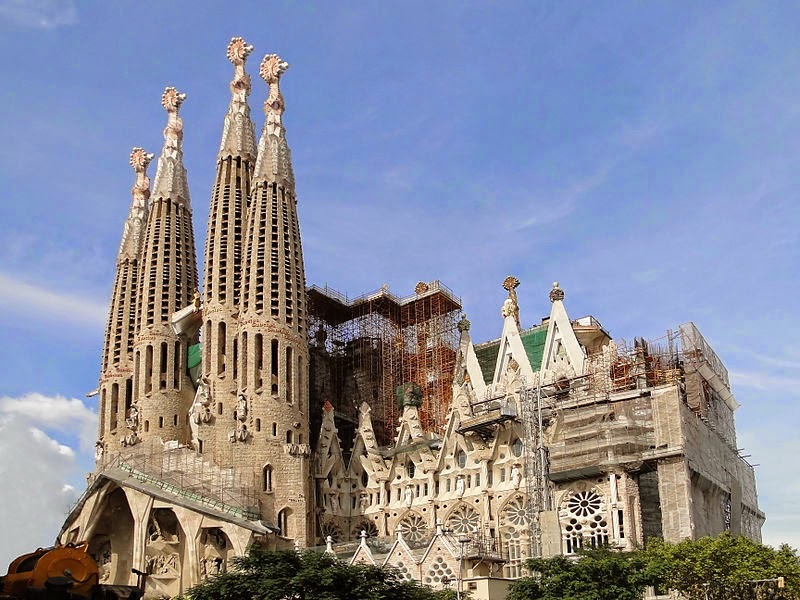 You could even take a family friendly tour of Barcelona too which is a great way to see as much of the city as possible in a shorter amount of time. Simply walking around the city we found to be fun, the unique architecture, Sagrada Familia, inside and out, Olympic park, etc. There is no shortage of fun to be had around the city! Everyone knows that Spanish food is incredible, and the people of Barcelona put their own special twist on it to make it even better. Your kids will love trying the unique dishes such as Fideua (like paella but with noodles instead of rice and a slightly different sauce) and Calcots, and you can make a day of it by trying them out at one of the city’s many incredible food markets. They’re free to enter and most of them boast high quality products at really cheap prices – often much cheaper than eating at a restaurant. Alternatively you can also get set up in a cooking class for you or even for your kids. That way you can bring those amazing culinary aromas and flavors home with you to enjoy forever! Have you been to Barcelona? What tips do you have for enjoying a holiday there? Aloha, I am so glad your post stressed the importance of respecting and keeping distance from honu, as well as the reasons why. When we lived on Kaua'i it broke my heart to regularly see ignorant tourists harassing the wildlife. Sea turtles are some of my favorite animals to see while SCUBA diving. I haven't been to Hawaii, yet but it's on the list. I never understand why people insitst on touching wild animals. They are wild for a reason. Agreed! It makes me nuts that people do not see the ignorance in that type of practice. I love in Hawaii that they approach you, sort of the best of both worlds. We know we are maintaining respect and at the same time we get to be super close to them. Me too, it feels like you are part of their world. I love sea turtles, too! While I haven't ever seen a grown one in the wild, the South Carolina coast (where I live) has many places where you can watch the hatchlings go back into the sea (soooo cute!). They're such amazing animals, and I would love to see them in a setting like this! This looks amazing, thanks for the great tips! We tried to find sea turtles while on Maui while we were there a few years back but weren't lucky enough to find them in the end. WIll have to head to the big island! Now that is 1 thing I haven't seen and am dying to. Yes they are everwhere. I also have a post on how to find them on Oahu! I've had threats about that one but well its still up. I figured it was something people want to see in Hawaii so a specific post about it is important. Maybe I need to spend more time in Maui si I can make a list for there as well! Aww, I missed a big release they did here on the Big Island due to other plans but I really wish I just ditched the other plans and went to the hatching! Oh wow! I've never been to Hawaii, but imagine swimming alongside those beautiful babies! Yes, definitely one of the things we'l miss when we leave. It happens almost every time we go to the beach here! Oh my goshhh. I would be so excited to see sea turtles! They're so cute!! Wow, did they really cuddle with people? This is how it looks from the picture. I am surprised that turtles would actually enjoy this, too:) These ones seem like they did. LOVE hawaii and LOVE sea turtles! We went a few years ago and had the time of ours lives watching them swim around and head to the surface for some air. Hoping we'll see some in Mexico this summer! Wow! I can see why your other turtle post was so popular. What a great resource! Your pictures are also amazing they really show the kind loving spirits of the turtles. Mahalo! Thanks! That is truly what they are like. I feel so fortunate to have had so many great encounters in the wild. Yes at that 1 beach they really do. I have other pics that didn't come out as good of the turtle literally on my 7 year olds back. We weren't feeding them or anything. After they were so close we started handing them some grasses as it seemed like what they wanted. I think they are just used to people there and know they aren't harmful. Scary though as when they go someplace else it may be harmful. Oh I bet you will! When I think of sea turtles Hawaii and Mexico are the first places that come to mind! Great post and beautiful photos, I'd love to see them up close. Beautiful animals. Interacting with turtles is one of the best experiences in Hawaii!